Merry Christmas and Happy New Years to everyone on Arcade Projects. I present to you, the definitive TMNT2 conversion guide. Please let me know if there are any questions or if anyone needs clarification. Please do not make these to sell, and most importantly HAVE FUN!!! Remove all mask roms by cutting the IC legs as close to the body as you can with diagonal micro cutters. Remove the mask rom's body, remove each of the pins by heating them with your solder iron and extracting the pin with tweezers. Clear the throughole using good quality desolder braid, or a desoldering station. Inspect for any trace damage before proceeding. Assuming everything checks out OK, install quality sockets in each of the IC locations where the masks were removed (my board required 6 total). Remove the existing PAL IC's at 4E and 5E. Install the 20 and 22 pin sockets, follow the instructions above for specifics on removal. Burn the "Konami-54253.jed" to a Gal16v8 PLD, install in location 4E. Burn "Konami-053997.jed" to a Gal22v10 PLD, install it in location 5E. Hold the test switch on the PCB or your cabinet, power the cabinet on. 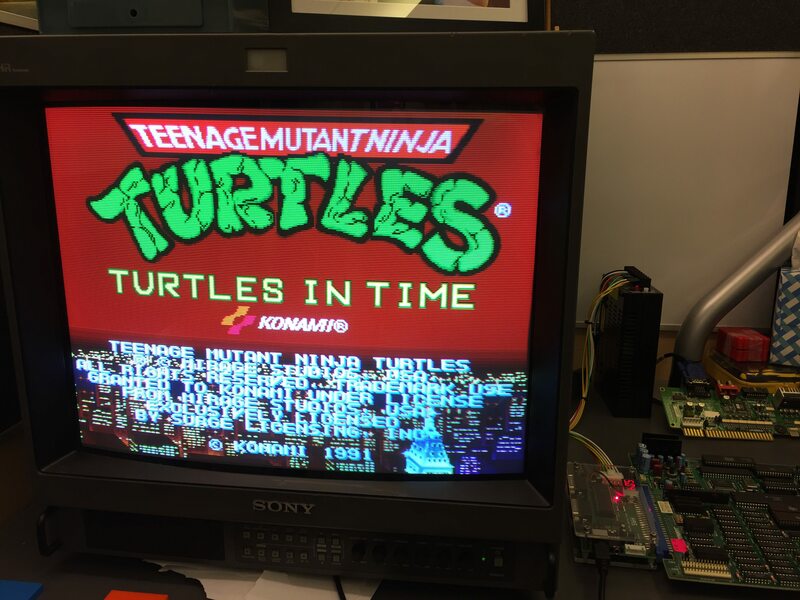 This will trigger eeprom initialization and load TMNT2's default settings. Failing to do this step will result in the game not passing the rom test and resetting indefinitely. *When you get your game booting, enter the test menu and run a rom test. If any of the mask roms are failing, go back and double check your soldering work on the sockets. If you are not careful, it is easy to damage the via's during desoldering. *The 40pin 4mb Eproms are "Non-Jedec Roms", also known as "Mask Rom Pinout". They are not the same as 27c4096, 27c4001, etc. Be sure to get HN27c4000G or an equivallent. *If you are having trouble finding 27c800 eproms for a good price, simply use 27c160 and "double the binary". You can do this either by using Porchy's wonderful BinManager tool, or by using a command prompt in windows with "copy /b file1.bin + file2.bin combined.bin"
*If you are having trouble finding or programming GAL22V10 PLD chips, you can reuse the PLD that came with Quiz Gakumon. The program rom memory map is different, but no worries there! Simply "interleave" program roms 8E and 10E (install in 8E) and 8G and 10G (install in 8G). Burn the resulting binaries to 27c020 eproms. Use BinManager to interleave the files. *Japanese distributors generally have Quiz Gakumon in stock. eBay, Yahoo, Forums generally do not. Try emailing Game Kanaya, Tops Japan, G-Front or any of the Japanese based distributors. Don't be shy, most will reply to overseas inquiries! Expect to pay about 15,000¥. The post was edited 1 time, last by cpsystem3 ( Dec 19th 2017, 4:52pm ). Some notes from the other thread: Konami PCB Conversions possible? Similarly the QG PAL16V8 is the same as TMNT2 as well. This saves quite a bit of annoying desoldering. Also it was recommended that for the 27c160 to use a 50ns chip as slower chips can cause stability problems (I don't know why exactly). @cpsystem3 Thanks for sharing this. Thank you @cpsystem3 for this awesome guide. That is true for factory conversions that Konami did (they sometimes left behind TMNT2 mask roms). The board I used was always a Quiz Gakumon, and had those rom locations unpopulated. Interesting regarding the 50ns chips, I used 100ns and did not have any issues. My board has been played through to the end many times. Thanks for the write up. I'm midway through this conversion, just waiting on some sockets and chips to arrive, but I'm not 100% sure I got the non Jedec 40 pin chips. Will have to look, but I think I was missing that part. Nice one dude! Thanks for the share, love to read up on stuff like this. I should have spares on hand if you need. Be aware a lot of the Chinese "budget" programmers have trouble with these chips (at least in my experience with Willems junk). @cpsystem3 my quiz had the leftover roms on it so I think I just need 12k and 16k. If you have two, I'd be very appreciative. I have a top3000, but hell if I'm over for that i8751 anyway maybe you can program those also? Sure - i just checked and have 5 blanks on hand. Hit me up when the MCU is here and we'll get it all sorted out. What are the pitches for the DIP sockets? I was finally getting around to ordering parts for this and noticed there are different ones for some. Finally wrapped this conversion up! Thanks for the help @cpsystem3 @twistedsymphony and @skate323k137. My original GAL didn't seem to work, but after giving it a 2nd try I think it just requires you to lock the security on it. Unfortunately my board has a lot of static in the audio, so time to check the pots, caps, amps, etc. But hey at least it's working! oh nice, I need to do that ! The post was edited 5 times, last by CoolFox ( Feb 6th 2018, 7:25am ). Just updating this. If you're hearing a lot of static in the sampled audio, you might have a counterfeit 27c160. I don't think it matters if it's 50ns or 100ns.. what matters is that it's not a fake chip! I was able to clear all my audio problems by sourcing another 27c160. Not sure who was first doing the conversion but it's quite old (10/15 years?). IIRC member Pac-r on a french forum found the information on the System16 website that boards were identical and performed the conversion. Not sure who was first doing the conversion but it's quite old (10/15 years? ).IIRC member Pac-r on a french forum found the information on the System16 website that boards were identical and performed the conversion. I don't believe the necessary PAL dump was publicly available until Fox submitted it to jammarcade, though I could be wrong. I've discovered over the years information wasn't widespread within the arcade community in general. P.S. : A lot of conversions have been well known for a long time but were kept secret cause few people were making a lot of money with them. There were conversions sold as OG and no one could spot them (matching datecode on EPROMs and fake labels, or EEPROMs/PALs with reference engraved with a laser machine used for 3D "crystal" souvenirs). I have some GAL22V10 on the way but thought I'd have a go at interleaving the program roms. It doesn't want to boot at all using 2x 27c2001. Is there a specific setting I should be using in BINman?